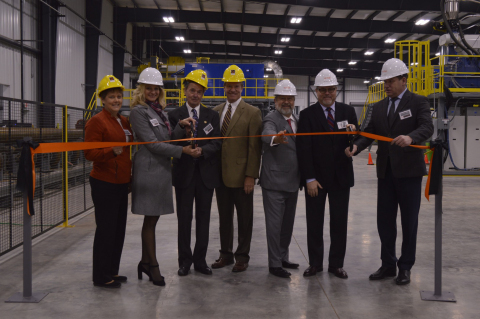 IPSCO Tubulars Inc. (“IPSCO”) today announced the opening of its new ULTRA™ FBE Coating Facility in Wilder, KY. The coating facility is strategically situated near the rich natural gas deposits of the Marcellus Shale formation. The plant externally coats flowline, gathering and transmission lines up to 24 inches in diameter and has excellent logistics to ship the finished pipes by truck, rail or barge. The 280,000 tons of annual coating capacity is available in Fusion Bond Epoxy (“FBE”), Abrasion Resistant Overcoat (“ARO”) and Speciality Coating. The plant is certified to industry standards, including CSA Z245.20, NACE SP0394, and AWWA C213, as well as end users’ specific standards. Extensive quality and material inspection equipment will be utilized. IPSCO Tubulars Inc. is a producer and supplier of seamless and welded oil country tubular goods and other pipe products, with headquarters in Houston, Texas, and manufacturing facilities located in Texas, Pennsylvania, Ohio, Kentucky, Arkansas, Oklahoma, Iowa, Nebraska and Alberta, Canada. IPSCO Tubulars Inc. is a subsidiary of PAO TMK, one of the world’s largest producers of tubular products.